I don't know if RED TURTLE is intellectually one of the best films of 2016, but emotionally its at the top of the pile. This fable about the cycle of life wrecked me emotionally and I was audibly and largely uncontrollably sobbing through the last third. The plot is simple. A man washes ashore on an island. He attempts to leave but is thwarted. He encounters a giant red turtle and his life changes. This is not a realistic film. A twist about a third of the way in makes it clear that this is something more. The plot after that is nothing earth shaking, it is the arc of a life. Its a fable. It is the up and downs of life. That's it. Either you take it on it's own terms or you don't. I can not and I will not tell you more than that because it not only is it so simple but because you have to see the rhythms of the film for themselves. I went in blind and that's how you should too. A largely wordless film, the only word spoken, beside gibberish, is "Hey", Otherwise the film is driven by the score by Laurent Perez Del Mar. Playing over the entire film the music acts as the dialog and inner monolog of the characters. Beautifully working in concert with the story and images it deepens everything we see. It connects us to the story and the characters in real and visceral ways. As good as the storytelling is it would be nothing without the score. The film is a Belgian co- production with Studio Ghibli is being compared to the work of that legendary studio,but that's shouldn't be the case. While some of the skies are Ghibli blue, the look is less Miyazaki than Chris Van Allsburg, Herge and Moebius (as well as other Heavy Metal artists). This is the best book illustrations come to life. This is a film with designs familiar yet startling new. The look and feel of the film bleeds into your mind and washes over your consciousness because it feels as if it is part of you. While there is no doubt that this is the work of Michaël Dudok de Wit it is also abundantly clear that Isao Takahata, the true master at Studio Ghibli, had a hand in it. I say this because the film shares a humanity and sense of life that I've only found in Takahata's films. I suspect that Takahata, listed as Artistic Advisor in the credits, simply tweaked the story for maximum emotional impact. And he knows emotion, since he is the only filmmaker who has reduced to be sobbing messes more than one time (this is the third time after PRINCESS KAGUYA and GRAVE OF FIREFLIES). The result of the co-production is a masterpiece on a level rarely reached by any art. RED TURTLE transcends cinema to be a masterpiece of culture of any sort. I LOVE this film. It is one of my favorite films of 2016 and one of the best of the year as well. You have never seen anything like this though you think you have. It will make you feel things you've never felt in a movie. 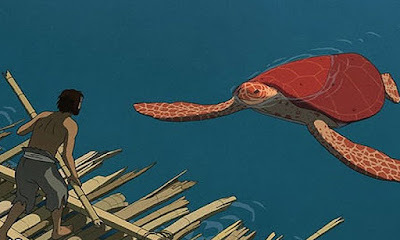 RED TURTLE just finished it's Oscar qualifying run and opens in US theaters January 20th.